Hello! I am back. Sorry for the absence as Mamarazzi was out of commission. Caught very bad bacteria infection from me. It's her turn to shiver pulak. Now she is feeling much better with a course of strong antibiotics, hence here I am again. Bringing the first good news...Jeng! Jeng! ...I received this letter! It says my application for Tabung Warisan Anak Selangor(TAWAS) have been approved. Mamarazzi first heard about this TAWAS from Alice Phua's Blog. Candidly, Mamarazzi had forgotten about this totally as when the Fund was open for registration again, there was some confusion at the YAWAS. Some staffs there said I am not eligible as at the time of application, I had exceeded 1 year old. All application must be before the kid reach their first birthday. Papa and Mamarazzi insisted to leave our Forms there as in their website, they stated that the Fund have been re-open for registration. Later on Papa and Mamarazzi checked online and saw that our application was rejected. Well, we thought that was the end of story. That is till I received this letter on Friday. What is TAWAS? Seems that Selangor Government is giving each child who is eligible, RM100 in Savings and when the child reach 18 years old, the child will receive RM1,500. Errr....not very sure how to explain this. For further information, please visit their website http://tawas.org.my/. Mamarazzi is not clear on the the terms and condition. From their website, it seems that not only kids born in Selangor are eligible but kids from Negeri Sembilan, Perak, Wilayah Pesekutuan Kuala Lumpur and Pahang are also eligible to apply for this. The second good new is....Mamarazzi saw this announcement at their website "Pendaftaran bagi tahun 2008,2009 dan 2010 telah dibuka semula. Tempoh pendaftaran adalah TERHAD." It means that they have re-open the Fund for registration again. Those who are born 2008, 2009 and 2010 can apply now. Anyway, no harm trying your luck if your kids are born in those years. Muhahaha...RM1,500....okay okay...by the time I am 18, this amount maybe have been peanuts but no harm being happy about receiving money, right. Just treat it as a Birthday pressie from the Selangor Government to me lor. RM100 a year, RM1,500 in 18 years? Starting from year of birth or present age (How old? 3 or 4?)? Whatever it is, you're being shortchanged. Buy savings investment policy with insurance company - lots of returns, better than saving in the bank. What if another political party comes into power? wah, now giving away money everywhere!! i think before 2019 can bankrupt already!! or are they trying to scoop away all the money before they leave??? Glad you're feeling better! So, it is like a savings account for kids? Do they get to earn interest over the years? Long live Selangor Government then! hahaha.. first time I heard of this too.. many will want to migrate to these states..
wow..so good oh..too bad my anak is not from Selangor la. Take care your Mamarazzi well,ok. Dont bully her ohh. Hentam aje la. They give we take la. Duno how it goes. Seems that they place RM100 in Fixed Dep with AmBank for the child. Then when the child reach 18, he/she will get RM1,500. SHouldnt be a problem if another political party comes into power as the money is with AmBank and not YAWAS. This round is the same. yes, it's something like that. 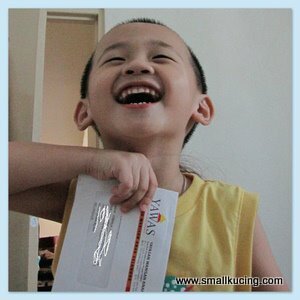 The organisation place RM100 into the Bank a/c for the kid and accumulate interest. Mini windfall is better than no windfall. Too bad Chloe is over-aged already. Wonder why they limit this to kids born in those few years only? Thx for sharing the latest update, will try our luck too! as long as is free money, i dont mind take geh, but too leceh lah to apply, need the adun to endorse..so i give up already..
Good and great to hear that. Maybe you can consider buying more books for your little one. Hope you are feeling ok and will catch up from now on Kathy. That makes sense that by investing RM100 every year, the child at 18yo will get RM1500 if he/she starts at the age of 3. If he/she starts at the age of 4, will it still be RM1500? Hi Mamarazzi, do you mind sharing with me what is the website address to apply for TAWAS? Thank you in advance. But it will take them long time to respond. It's advisable that after you submit, you give them a call.